What is the typical Task Lifecycle? When a task is created it is set to Open. The assignee will receive an email with the task summary, due date, etc. The owner of the task then views it and can set the task to Closed if they feel it has successfully been completed or Open with comments and further instructions. It is not uncommon to have a task go back and forth like this for a while before it gets Closed. If the task requires customer approval before closing it, we will use the "Send email message" option on the task and notify our customer that we need their review and approval. If a task needs customer approval we set it to Review with Client. This tells us that there is nothing further we can do until we receive feedback. Once we get the blessing from our client we go in and set it to Closed. There are a variety of ways to tune the task flow to match your process, but that is how we do it. Some Intervals customers change the assignee of the task back and forth while keeping the status Open. We like to keep the owner to assignee relationship and manage tasks based on their status. One other tidbit on user levels. Resource level users can close tasks if they created the task, but they cannot close a task that someone else assigned them. Are the emails sent from Needs Assistance and Verify & Close automated? Can I turn auto-emailing on or off for custom phases? How do I edit the auto emails for the existing phases? I'd like to know the answer to torinhill's question too. 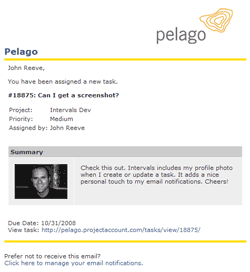 The emails that are sent when a task comment is made or the task status changes are automated. There are no custom triggers (certain status, certain module, etc.) and the message cannot be customized at this time. This is true of all system generated emails. The "Send email message" functionality can be used to customize the email but that would be used on a case by case basis as opposed to establishing a rule or preference for all emails/tasks going forward. Each user's email preference can be turned on and off but they are global for that particular user.